Bill 148, Fair Workplaces, Better Jobs Act, was introduced on June 1, 2017, by the Minister of Labour. That same day the bill was referred to the Standing Committee on Finance and Economic Affairs, which was given permission from the House to meet over the summer to study the bill. 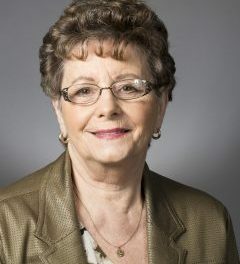 The legislation builds upon the final “Changing Workplaces Review” – a 420-page report containing 173 recommendations for how the province can improve its workplace regulations. 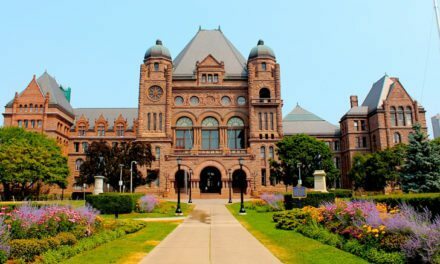 The bill includes raising Ontario’s minimum wage, expanding personal emergency leaves, changes to employment standards and other issues all intended to create fairer workplaces. OCSTA will be reviewing the bill for school board implications. The committee will be holding public meetings in Thunder Bay, North Bay, Ottawa, Kingston, and Windsor-Essex the week of July 10, 2017. Public meetings will also be held in London, Kitchener-Waterloo, Niagara, Hamilton and Toronto during the week of July 17, 2017. Written submissions are due Friday, July 21, 2017. Consultation for Ontario’s Rural Education Strategy: OCSTA’s submission to the Rural Education Strategy Consultation addressed issues such as the sustainable use of school space in rural communities, supporting decision making around school closures and supporting quality education in rural communities. The submission is available for view online. Meetings with MPPs: OCSTA continues to lobby the Ministry of Education and MPPs on behalf of all boards for items brought forward through resolutions, committee meetings and as recommendations in our annual Finance Brief. 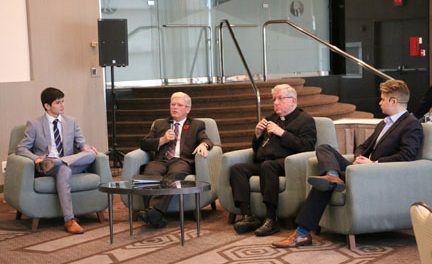 We also ensure that in all meetings with government officals and MPPs we continue to detail and discuss the value and contributions of publicly funded Catholic education to the success of Ontario’s education system and the common good of our province. For more information please contact Stephen Andrews, Director of Legislative and Political Affairs – sandrews[at]ocsta.on.ca. In response to recent media stories that have incorrectly reported on the eligibility requirements for religious education exemptions in Catholic schools, OCSTA’s President, Patrick Daly issued a Letter to the Editor that was published in the Midland Mirror and the Windsor Star. Earlier in June, there was significant coverage of the issue of religious education exemptions in Ontario’s Catholic schools. The people of our province expect a distinctly Catholic learning environment in Ontario’s publicly funded Catholic schools. Catholic school boards are entrusted to fulfil this important mandate. Section 42 (13) of Ontario’s Education Act sets out the relevant exemption for programs or courses of study in religious education. This section applies to students who attend Catholic schools but whose parents are public school supporters. The intent of Section 42 (13) is to accommodate the students of non-Catholic families who choose Catholic high schools for their children’s education. This exemption does not in any way change Catholic district school boards‘rights to require Catholic students to take religious education courses in each of their four years of secondary school. Ontario has developed one of the most successful publicly funded systems of education in the world. It has done so in large measure because of the choice provided through the distinct mission of each of its four school systems. Together, these systems welcome and provide excellence in education to the 1.9 million students in Ontario. The four systems have helped shape the fabric of our society and made the quality of each better. Working co-operatively with the other publicly funded school systems, Catholic schools have formed an integral part of Ontario for well over 180 years. The graduates have helped shape the wonderful province and country we live in today. The structure of publicly funded education in Ontario, and the Catholic schools that are such an important part of it are to be strengthened and celebrated. The Together in Faith campaign for publicly funded Catholic education in Ontario has attracted approximately 10,000 new subscribers in the 7 months since the campaign’s launch at the end of 2016. These subscribers have responded to the online stories and videos of caring school environments, social justice initiatives and outstanding academic achievement that are the hallmarks of Ontario’s Catholic schools. The successful launch of this campaign is due to the significant commitment, interest and participation of Catholic trustees, directors of education, teachers, CDSB staff, students, parents and the parish community. Thank you to all campaign supporters! 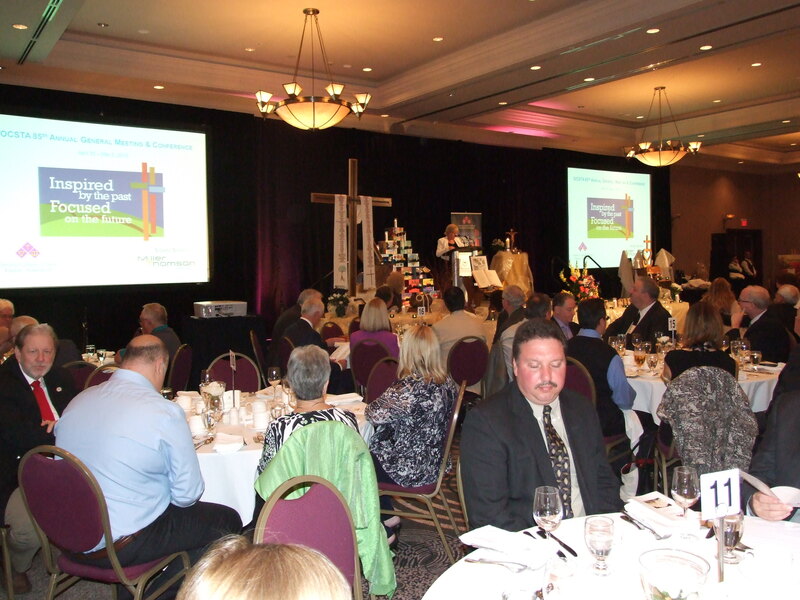 Your actions have contributed to the increase in awareness of the value and contribution of Ontario’s publicly funded Catholic schools to the common good of our society and the vibrancy of our province. OCSTA also appreciates the support of our new campaign partners the Ontario English Catholic Teachers’ Association (OECTA) and the Assembly of Catholic Bishops of Ontario (ACBO). 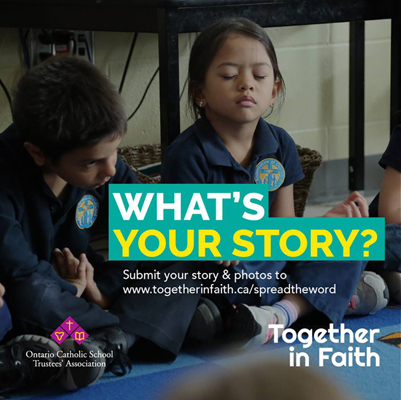 If you have not added your name to the Together in Faith list, we invite you to do so now by clicking: www.togetherinfaith.ca. 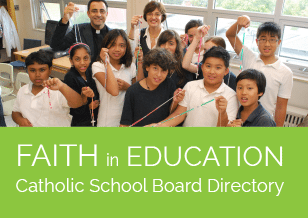 Together in faith Ontario’s Catholic schools will continue to provide successful Christ-centred learning environments as part of this province’s strong education system. For more information please contact Sharon McMillan, Director of Communications – smcmillan[at]ocsta.on.ca. Saturday, October 14, 8:30 a.m. – 2:00 p.m.
A reception for delegates and spouses will be held on the evening of Friday, October 13 at the Holiday Inn Express & Suites in Timmins – details to follow. Agenda details for each meeting will be provided to all boards in the coming weeks. During the recent CCSTA Conference, OCSTA First Nations Trustee Judy Manitowabi and OCSTA Director of Catholic Education, Brian O’Sullivan presented on initiatives and curriculum changes occurring in Catholic school boards as a result the Truth and Reconciliation Commission and its 94 Calls to Action. Co-presenting with them were staff and trustees from the Regina Catholic school board, Donna Zieglar (Chair); Rob Bresciani (Vice Chair), trustees Vicky Bonnell and Deb Bresciani, as well as Domenic Scuglia (Director of Education). This presentation covered curriculum changes in each province as a result of the TR Commission –including new initiatives by the Saskatchewan and Ontario Ministries of Education. Regina Catholic serves First Nations students from the Treaty 4 district, as well as a large number of Metis students. The Regina team presented on initiatives in their board including plans to increase student achievement for Indigenous students, support for use of Elders in the schools, the Winter Buffalo hide project, Orange Shirt Days in recognition of the TR Commission, mandatory treaty recognition in all its schools, teacher professional development, as well as student awards all to support Indigenous knowledge in their board. The presentation addressed the important statements by the Canadian Conference of Catholic Bishops (March 2016)., particularly its eight point plan called “Walking Forward Together” to support contemporary challenges in Indigenous communities and to work together for a more just future. The presentation addressed the work of OCSTA in Indigenous education the past three years, namely supportive resolutions at AGM’s , participation in a provincially developed module for trustees in Ontario about Indigenous education, and current work by ICE to lead a research project on an educational bibliography for use by teachers in Indigenous education. As a member of the Ontario Coalition for Children and Youth Mental Health, OCSTA is pleased to share the Call for Presenters for the Coalition’s 2018 Summit for Children and Youth Mental Health. We hope OCSTA’s members will consider this invitation as an opportunity to share the good work being done in Catholic schools to address children and youth mental health needs. The Summit will be held April 12 & 13, 2018 at the Toronto Allstream Centre. Hopefully your board will be a part of this important event and if so, please let OCSTA know of your submission.